This post comes about because a few people have written to me asking is Eddie Hobbs’ new US property venture worthy of consideration. The price threshold at €500k is pretty steep, so it rules out most investors, in a diametrically opposed strategy to that taken by Brendan Investments some years ago. 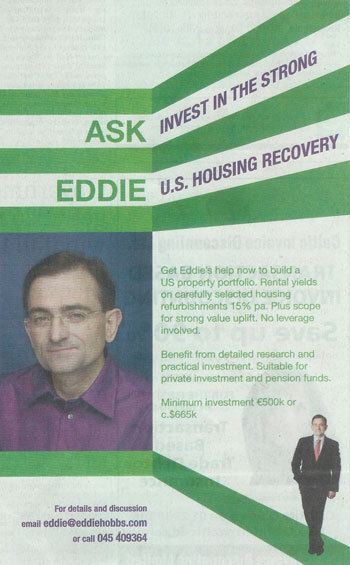 Therefore, quite a few others have written on the back of the ads wondering if they should be looking at property investment in the US themselves because Eddie is getting involved there. It’s a logical question when you see Eddie taking out quarter front page ads in the national media to highlight that fact that he is promoting opportunities Stateside. Eddie Hobbs US Property – How is Brendan Investments Performing? The obvious first question for anyone considering an investment with any vehicle with which Eddie is involved is ‘what is his history in overseas property investment?’. This is not that difficult a question to answer, because he’s been involved with Brendan Investments Property Management Plc., which invested predominantly in Germany, for some years. I asked Eddie himself how it has been performing. Eddie Hobbs US Property – Where is it Located? So there you have it, that’s Eddie’s pitch. So I asked the obvious question – ‘Where are the properties located?’ Let’s be honest, that really is the deciding factor as to whether they are worth considering for investment purposes or not. But I got no answer, really, in a kind of Eddie-esque fashion (see below, we did eventually find out that they are located in Detroit, which may explain why he’s so reluctant to name the location). I’ve known Eddie in passing for a few years now and always found him to be very direct. He’s an interviewer’s dream if he wants to tell you something as he will load it on with all the charm he can muster, lots of witty anecdotes, etc. If, on the other hand, he doesn’t want to expound on something he can be a tough nut to crack and can get pretty defensive – so it appears to be at present. He also finds it very difficult to disguise his distaste for the media. I know, the irony is stark, but in his defence, he has had to put up with some terrible drivel written by people who have not a clue what his business entails. Anyway, the answer I did receive. Eddie Hobbs US Property – Should I Invest? So that’s about it. 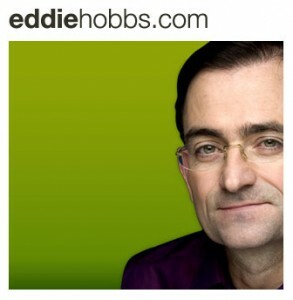 Eddie has said that he will write a full report on the investment opportunity, when he does I’ll put a link to it here. In the meantime it’s impossible to urge people to consider the investment because the most important part of the jig-saw, no matter what Eddie says, is missing. Without knowing where the properties are located you’d have to say ‘give it a miss for now’. (Update: Knowing where the properties are located I’d still give it a miss. I don’t claim to know much about Detroit and its housing market but what I’ve managed to ascertain wouldn’t have me rushing there. I’m sure Eddie and his team have done their due diligence and are comfortable with the product for their purposes). On the question of whether the US as a market is worthy of consideration then the answer would have to be ‘yes, it certainly is, but be very careful.’ The US is enormous and contains thousands of micro-markets, often dozens within the same city. To say the US is a definitive ‘buy’ is far too simplistic. Some areas are ripe for investment, others are being over-promoted and investors are being over-charged for what is pretty shoddy product. I’ve seen, and reported on, buy-to-let houses being promoted for US$44k that are available locally for US$8.5k – you need to know the areas, what is available, what letting demand is like and, most importantly, what that property is really worth locally. It would also help to know if the property is in tax arrears, as almost one third of Detroit properties are – this website may help on this front and a check here is highly recommended. Update: One eagle eyed reader pointed out to me that Eddie has actually stated on his own website that he is, in fact, investing in Detroit – see here from January 11th 2013. Before packing your bags and heading for the US Midwest, I’d have a quick read of this – it might give some perspective – from the Daily Mail, but don’t hold that against it. The rough end of Detroit is not obviously where Eddie and his investors will be camping out, but it does give an overall view of just why property is so cheap in the city. Buyer beware, etc. Here’s a different take on the story from the Detroit Free Press (featuring Metro Property Group, read on). We have become aware of a case filed in the United States District Court Eastern District of Michigan, Southern Division recently against our main US service company, Metro Property Group (Metro). It is to be noted that no claim or alleged impropriety is made against Brendan Investments. We have worked with Metro for the past 2 years and have found the company to be professional. Metro is now dealing with Canadian Funds, USA REITS and high net worth individuals who send due diligence teams to assess Metro’s abilities and professionalism. We have assessed the market in Detroit including service providers over the past 2 years. Many of our investors have met the Metro team and have seen its work first hand and subsequently invested. Metro has provided us with full transparency from the start to the end of the process. For its part, Metro Property Group claims that it is confident that the case will be thrown out of court. There is a follow up piece on May 10th in the Independent available here. After that you can make up your own mind on the whole situation. It is also probably wise to consider that, with the US, your investment options are enormous, in fact they are so huge it can be very difficult to fathom just how many alternatives there are coming from small islands like the UK and Ireland. The advert earlier in the piece for EB5 investment in order to gain an American Green Card is just one such available option, there are many, many others. As always, readers, Caveat Emptor.